Allergy Advice: Contains Wheat, Milk, Egg. Storage: Please store in a dry and cool place, avoid keeping under direct sunray. Keep at room temperature. Ingredients: Mango Paste (Mango, Wax Gourd, Maltose, Palm Oil, Sugar) (48%), Wheat Flour, Butter (Milk), Sugar, Egg, Milk Powder, Salt, Flavour, Colour (Beta Carotene (E160a)), Preservative (Sorbic Acid (E200)). 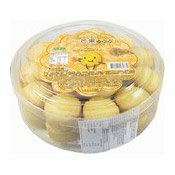 Simply enter your details below and we will send you an e-mail when “Mini Pineapple Cakes (Mango) (竹葉堂芒果酥)” is back in stock!